Rebekah cried again watching this. Knowing these dogs were in her favorite shows during growing up. Seeing dogs in the hospitals during those years she did not talk. And now having been around these dogs bits in her own world. She is so touched in so many ways! To say the least I’m also crying knowing all the tears over the years and joy that this work has brought to my daughter. In a way those TV shows were her friends while she could not talk and her world was her family and hundreds or neighbors animals. She always talked about those animals in those shows. Debbie Pearl you are one of her heroes! 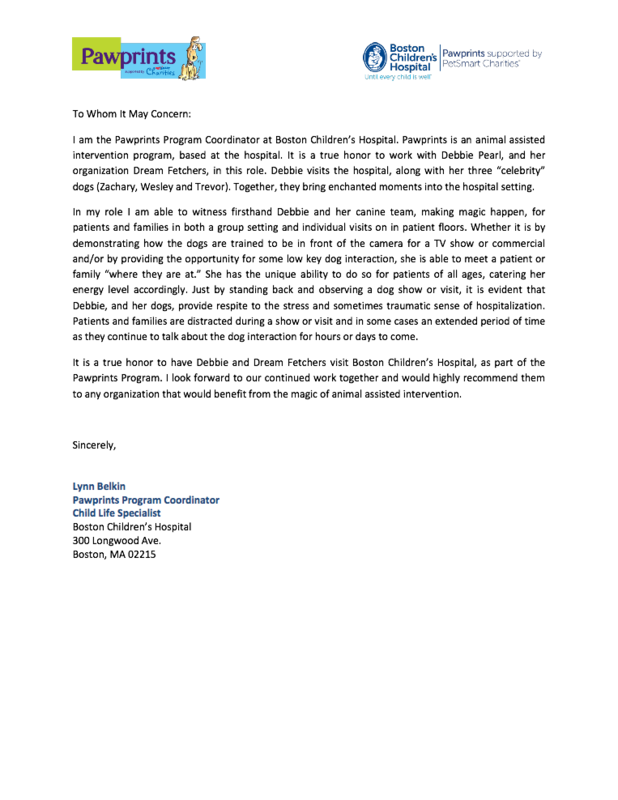 I am the Media Program Specialist at Boston Children’s Hospital where I manage the day to day operations of the hospital’s Seacrest Studios. I have had the pleasure of working with Debbie and her organization Dream Fetchers on several occasions here at the studio. Debbie brought three of her wonderful dogs (Zebe, Zachary, and Harlan) to our studio where she drew big audiences eager to see the dogs perform tricks live on each occasion! Our patients and families absolutely loved interacting with the dogs and seeing how they work on a movie or TV commercial shoot. Debbie showed the patients how the dogs are trained to go to a mark, look in a certain direction, bark on command, crawl, roll over, and more! Debbie is great at working the crowd, involving the patients and families, and bringing a great energy, all the while sprinkling in fun facts and humor into her demonstration. What Debbie brings to our hospital each time she comes is an engaging glimpse into doggie show biz. These visits are very special for our patients and families and gives them a fun distraction from why they are in the hospital. I would highly recommend Debbie and her furry friends to anyone hoping to host an interactive and interesting program full of fun and laughter. On Monday, January 5th Dream Fetchers came for a couple of hours to the Ronald McDonald House at Stanford to entertain our children with their dog actors. The children had so much fun watching and even more fun interacting with the dogs. The dogs were so friendly and the presenters were great with the children. It was such a nice way for the children to laugh, feel normal and have some relief from their current circumstances, which are usually difficult and sometimes heart breaking. The children crave to have that break in their day and interact with such lovely animals in which they can express themselves differently. I know pet therapy is something that helps our children through their healing recovery processes. The staff, volunteers and families of the Ronald McDonald House at Stanford are very thankful for Dream Fetchers’ volunteer efforts and its wonderfully talented dogs. On December 28th, 2008: Dream Fetchers, a 501(c) 3, is starting their nation-wide tour of Children's Hospitals and care facilities with their "Winter Kick Off Tour" beginning at the Ronald McDonald House and Children's Hospital of Central California in Madera . They will be visiting 11 different Hospitals, Houses and Schools in the Northern California area including Madera, Sacramento, Davis, Palo Alto, Oakland and San Francisco. In early 2009 the Dream Fetchers "Spring Tour" is planned for Southern California. Dream Fetchers offers critically, chronically and terminally ill children a once in a lifetime inspirational experience working with movie dogs from movies like "Karate Dog" and "Bratz" and hit TV shows such as "Hannah Montana", "Wizards of Waverly Place", The Suite Life of Zack and Cody", "That's so Raven" and "Sonny with a Chance"! A magical opportunity comes alive for these children when they interact with the stars themselves! The Children will be seeing a show to inspire smiles along with behind the scenes training techniques. Dream Fetchers is dedicated to the idea that through the unconditional love of animals any child can, in spite of their disabilities be touched and delighted by a friendly pup through a program of learning and love. Our program will bring children and animals together to interact and bond—a wonderful distraction from pain, depression or frustration. 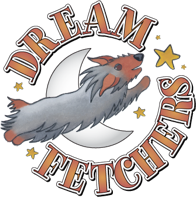 Please check out our web site at http://www.dreamfetchers.org and give us a call toll free at 877-729-7439 any time.